← Good bye to the pink toilet. Hello free toilets. 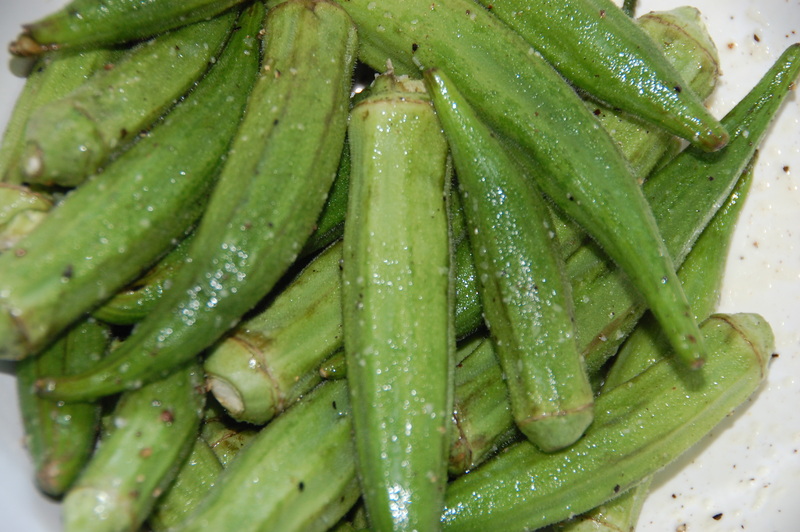 I have always thought of okra, if not fried, to be super slimy. If it is fried, I cannot get enough of it. Any other way, and my attitude has been very “blah” about okra. That is…until we met a nice lady with an okra stand. Last year on family vacation at Lake LBJ, my sister and I took daily walks around the neighborhood. One day, we ran into a huge seemingly community garden. We let ourselves in to admire all the veggies. We were approached by a nice lady who kindly told us that the garden was not a community garden, but rather, her own. And she sells what she grows. We told her we would be back later that day for some fresh veggies. 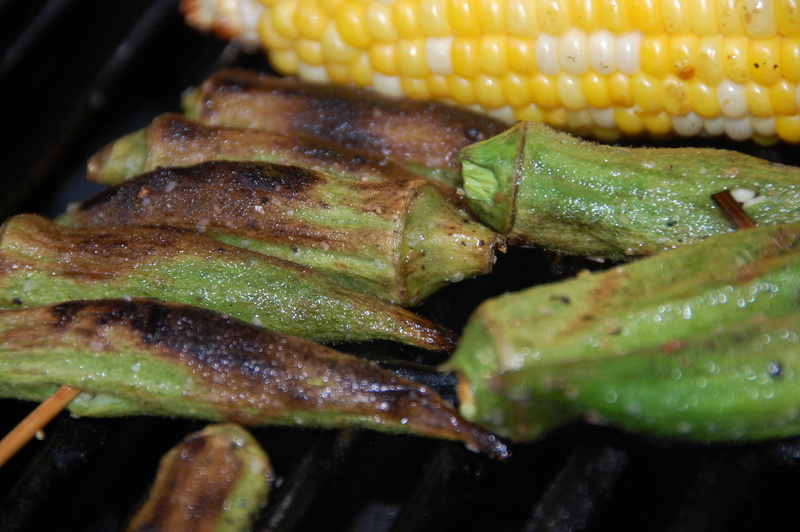 When we returned, she talked us into grilling okra. We were intrigued. Douglas, my sister’s husband, grilled the okra that night and it was good. Turns out, I could probably eat the stuff for the next 50 days and not get sick of it. It is that good. Simply wash and dry each piece really well, and then toss it in enough olive oil to coat (a tablespoon or so), and some salt and pepper. 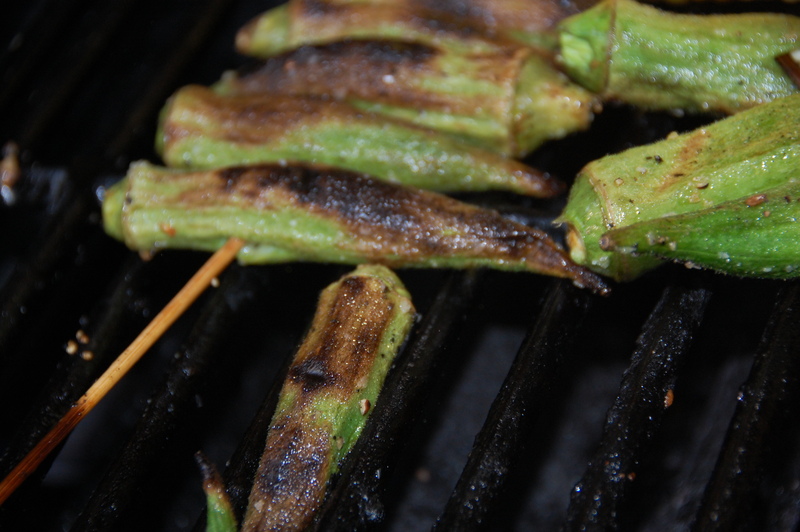 Then you can either put the okra in a grilling contraption (we don’t have one) or skewer them. Be sure to soak your skewers if they are wooden so they won’t burn up. Then grill them for about 10 minutes, or until tender. These guys look a little burned but that just gives them good flavor. Scott swears that his grilled okra has never been as good as Douglas’ grilled okra but I think he is just humble. Oh wow – that’s fantastic. The question – will it compare with the okra at Perla’s? um…I am not sure that anything can compare to that okra at Perla’s! !